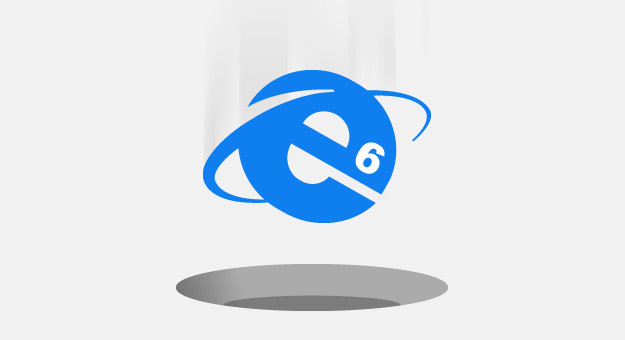 Home • News & Insight • Finally, Goodbye to Internet Explorer 6! The time has finally come. As of June 2011, we were seeing that less than 3% of people visiting a random sample of ten websites that we designed were viewing the websites with the Internet Explorer 6 browser software. As of July 2011 we stopped supporting version 6 as standard on new website projects. We could still design with Internet Explorer 6 in mind, but with a minor additional cost. Released in August 2001, Internet Explorer 6 was the most widely used internet browser for a couple of years until other browsers such as Mozilla’s Firefox brought renewed competition to the marketplace and offered people choice. Microsoft then released Internet Explorer 7 in October 2006 to address many of the failings of the previous incarnation and compete with the modern web capabilities of their competitors’ browsers. However old, Internet Explorer 6 is a browser that web designers have not been able to move away from completely for a number of years. Many larger businesses have retained the sit in their IT infrastructure to simplify internal system management, and so compatibility of websites with version 6 was always a requirement. Thankfully, even Microsoft with their IE6 Countdown website now accepts that the time has come for us all to move forward, use a browser that supports modern web standards, and enjoy a better browsing experience. They of course would prefer you to update your computer to run the latest version of Internet Explorer, but there are many other choices available for free that offer a fast and reliable alternative. Mozilla’s Firefox, Apple’s Safari and Google’s Chrome are all excellent browsers at this time. And a final point to note, there is another big reason why it's good for you as our client. With less time now spent on checking each individual web page in Internet Explorer 6, we get to spend more time on the core design and build of your website so that it loads quicker, gets more visitors, and entices more customers.